Original fair premium. 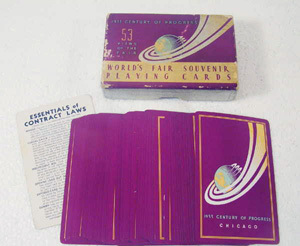 Boxed deck of "1933 Century of Progress, Chicago World's Fair Souvenir Playing Cards". Featuring 53 unique b&w views of the fair on the fronts. Exhibits, architecture, etc. Cards are vivid fushia with red and white border, planet with trailing rings, and "1933 Century of Progress Chicago, on the backs of cards. Complete deck, very nice condition, crisp, clean, look unplayed. Silver edges. Printing on the box top shows some wear, rubs. Complete deck, 52 cards, one joker and one extra card with Contact Bridge Scoring, reverse side: "Essentials of Contract Laws". 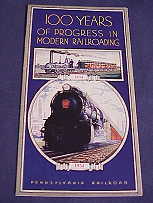 Original premium purchased at the 1933 Chicago World's Fair. Produced by Pickard China company. Marked Pickard in gold on the back. Features the Travel Building in black. Pretty aladdin style urns and floral work embossed around the outer scalloped edge. Very nice condition. Lite wear to the pattern, and some crazing to the glazing. No chips or cracks. Nice addition to any collection. Antique 1893 Chicago World's Fair Souvenir Goblet Ruby Red Flash EAPG Thumbprint Glass. 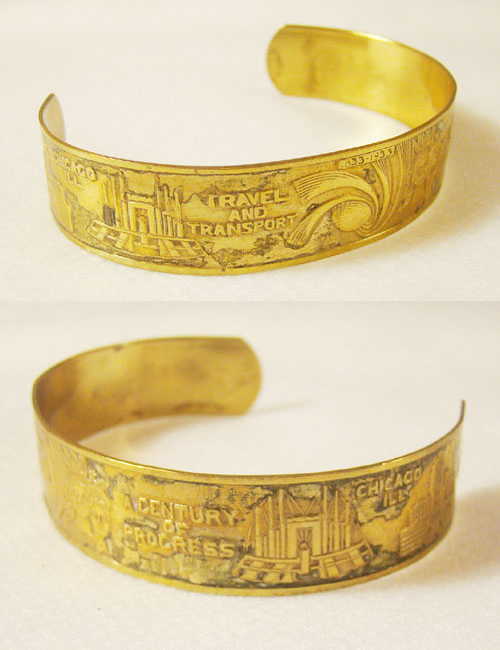 Gorgeous premium/souvenir from the 1893 Chicago World's Fair. Red flash, thumbprint pattern small stemmed glass. 4" tall. 2"dia rim. No chips, chiggers, cracks. Very lite wear to the flash. Fancy script " World's Fair 1893" is still sharply defined. A nice addition to a collection. This is a wonderful premium offered to guests of the 1964-65 New York World's fair. 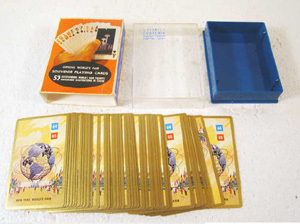 An official, souvenir deck of playing cards, complete in original hard case (plastic) with sleeve. This is a outstanding way to take a walk through the historic 1964-1965 New York World's Fair as each of the cards features a colorful picture of the various exhibits, architecture, rides, etc. Seldom seen views, buildings. The fair's theme was "Peace Through Understanding" and was dedicated to Man's Achievement on a Shrinking Globe in an Expanding Universe. American companies dominated the expo as exhibitors, and cards show everything from the renown Unisphere to Ford, IBM, GE, Coca Cola, to the monorail and more. Standard type deck was produced by Stancraft and is complete with 52 cards, + 2 Jokers. The deck is in very nice condition, no major damage. Gold gilt edges are still shiny and bright. Hard case is nice. Cardboard sleeve has some wear. Original premium purchased at the 1933 Chicago World's Fair. Produced by Pickard China company. Marked Pickard in gold on the back. Features the Fort Dearborn exhibit building in green. Pretty aladdin style urns and floral work embossed around the outer scalloped edge. Very nice condition. Lite rub wear to the pattern, and some crazing to the glazing. No chips or cracks. Nice addition to any collection. Silver metal. High relief fair medalion on the top. New York World's Fair 1939 On bottom rim NYWF. 3-1/2" long and 7/8" widest point. Nice condition. Chicago World's Fair 1933 Art Deco Inkwell JB 622! 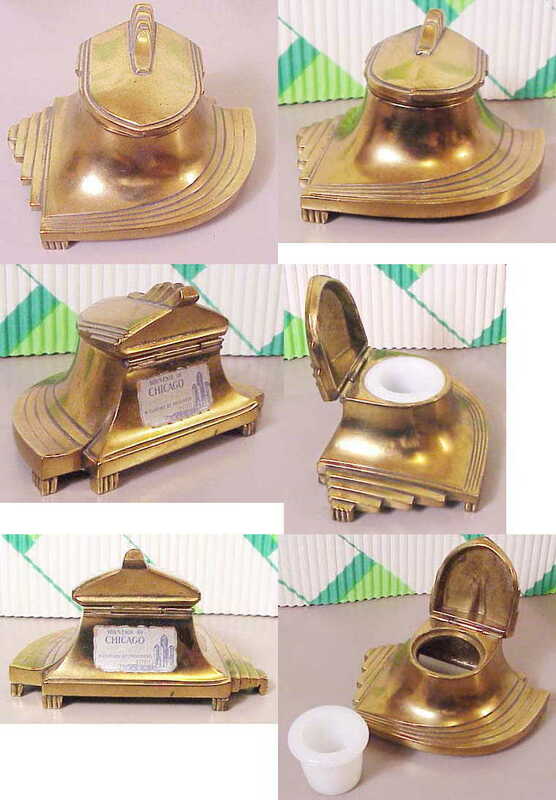 This wonderful inkwell was a premium offered to fairgoer's who visited the 1933 Chicago Worlds Fair. 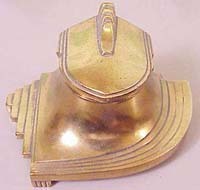 Art deco curved, stepped design brass with hinged lid,with an opalescent milk glass insert. Raised and sets on five ribbed feet. It was produced by the JB foundry and is marked JB 622. 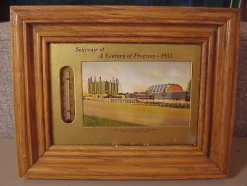 The label on the back say's Souvenir of Chicago World's Fair, A Century of Progress. Label has faded and has some wear. 4-3/4" x 3" x 2-3/4". Very nice condition overall. No dents or breaks. Complete. Lite toning to the brass. Glass insert is nice and has no damage. A rare find. 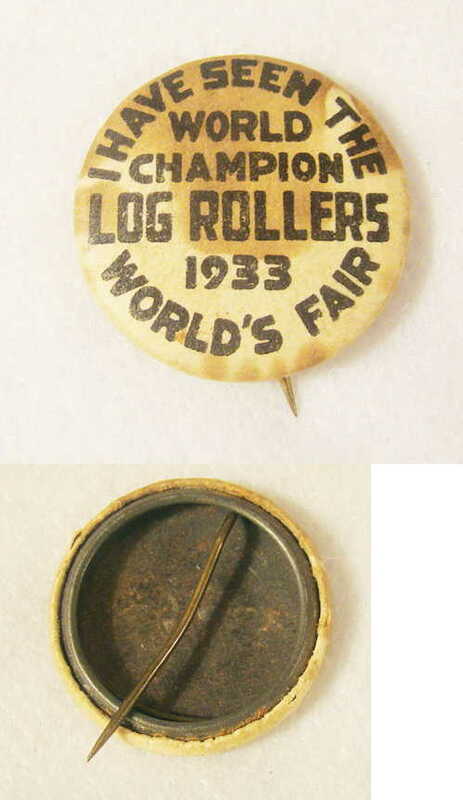 Original 1933 Chicago World's Fair Log Rollers pin back button. 1" across. Some darkening or staining. 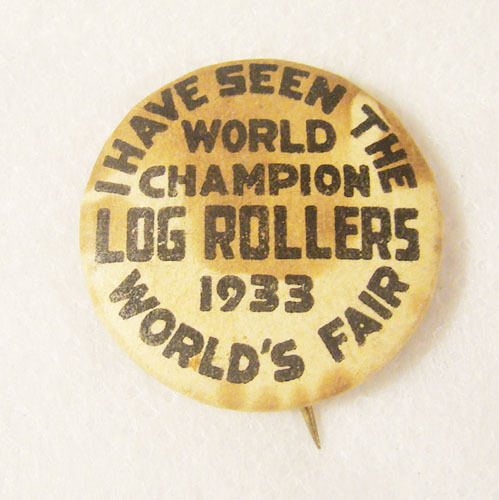 Given out to Fair visitors who watched the log rolling exhibit. 1933 Chicago World's Fair Ladies Pocket Mirror. 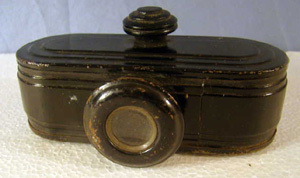 Brass frame with handle. 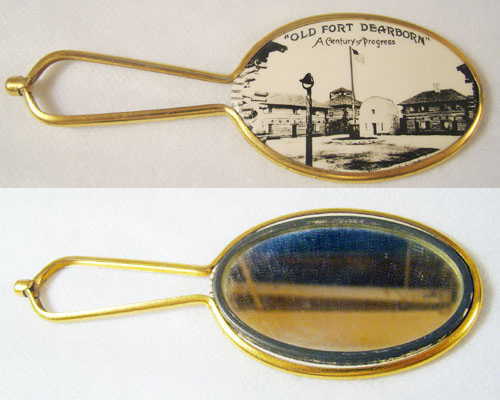 Celluloid covered "Old Fort Dearborn" scene on the front. "A Century of Progress". Nice condition. 5-3/8" long 2" wide. Mirror is still in nice condition. 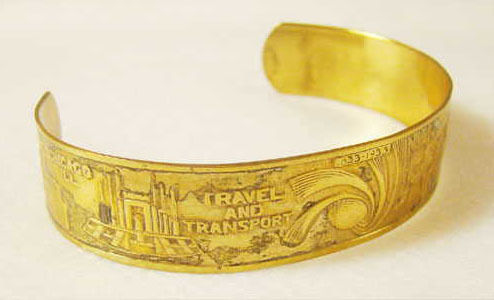 1933 Chicago World's Fair Cuff Bracelet. 1/2" wide. Gold tone plating. Fair scenes and icon. 5" long. Nice condition, lite wear to the finish. Oak Framed TRAVEL & TRANSPORT BUILDING w/ THERMOMETER! Nice color image of the 1933 Chicago World's Fair Century of Progress Travel & Transport Building and glass thermometer with mercury mounted in gold mat. Metal frame orignal backing . This has been placed inside an oak frame for display. Nce condition. No real damage. Glass front intact. Thermometer working. correctly. 9-5/8" x 7-1/2" overall. The Biographical Dictionary And Portrait Gallery Of Representative Men of Chicago, Wisconsin and the World's Columbian Exposition. By American Biographical Publishing Co. of Chicago, Ill., New York. H.C. Cooper Jr. & Co. Proprietors. 1895. Fine high quality publishing in its day. Large heavy book with leather cover. 11-1/2" x 9" x 4". Over 600 pages, 100's of portrait illustrations on steel. Full bios on hundreds of men. Each plate is guarded with velum (tissue paper) tipon.Gold gilt designed corners adornments. Front board is detached. Back board coming loose. Spine intact. Gilted page edges. Some of the velum pages have wrinkled. There is some foxing and overall discoloring to some of the pages. Overall the inner pages are pretty good considering the age. There is also a stiffness to the pages that makes one wonder if it has been viewed much at all. A very highly prized antique book. 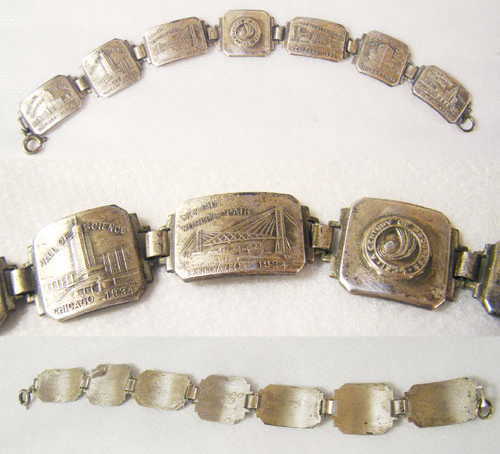 1933 Chicago World's Fair Silver Scene Bracelet. Beautifully detailed, fine quality. Silver plated. 7 blocks with clasps between. Ring clasp for securing. 6-3/4" long, 5/8" wide. Very nice condition still. Original darkened pattina. 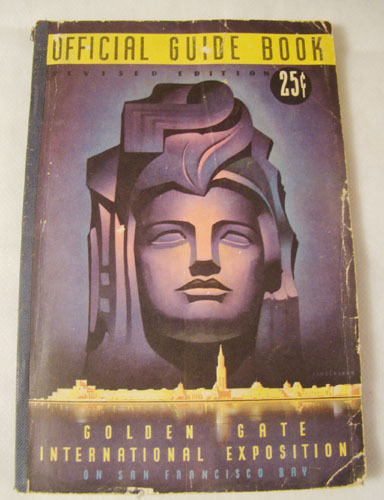 1939 Official Guide for the San Franciso Golden Gate International Exposition. Nice large fold out cartograph map of the Treasure Island fair layout. Booklet is complete. Some great images of the expo. Super advertising for local businesses in the tabbed "Visitors Guide" section. Booklet has 116 pages. There is some handling wear to the cover, inner pages are still nice. 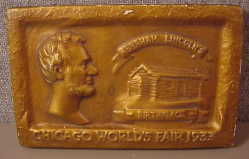 1933 Chicago World's Fair ABRAHAM LINCOLN'S Log Cabin Chalkware Plaque! Hard to believe this fair premium has survived. 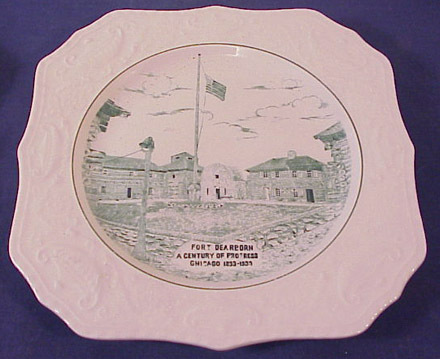 It is a fragile chalkware wall plaque from the Abe Lincoln exhibit. Feauting a bust of Abe and his birthplace cabin. Marked Chicago World's Fair 1933 across the bottom. Wire hanger on back side. 6-1/4" x 4".x 1/2". All original gold finish still intact other then a couple of flakes on the top border. No chips, chigger or cracks. condition overall. Silver & black art deco matting, Textured silver metal frame. Glass and mercury thermometer on the left window area. All behind glass. Nothing broken. String hanger on the back for displaying. 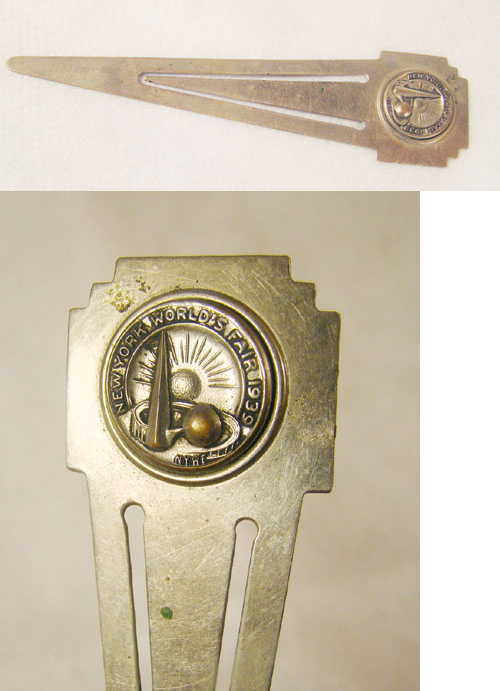 1933 Chicago World's Fair Souvenir Brass Thermometer Key Nice quality made premium Heavy solid brass. Fair emblem on the front center of the clover top, eagle and flag on the back side. 8-3/4" long overall. Glass thermometer with mercury mounted on the center stem. Back is marked Pated Aug 23, 1925. Complete nice condition. Nothing broken. Finish is still good. Mercury in the thermometer has seperated form being laid flat in storage. Should work out if hung and displayed again. 1915 PANAMA-PACIFIC UNIVERSAL EXPOSITION, SAN FRANCISCO, CALIFORNIA! Reverse painted glass in frame. Court of Palms. Superb details. Mother of pearl accenting. Tin filigree frame with original backing and wire stand. 9" x 7" overall. Glass has a crack across one corner. I've pulled it open some so you can see it. Its not that bad when viewed. Rare find for the 1915 Expo. 4-1/2" long. Fully engraved on the front. Fort Dearborn, Skyride Fair logos, etc, nicely detailed. Complete, intact, nice overall. It does have some toning to the finish. 1933 CHICAGO WORLD'S FAIR URN SHAKERS! 2-3/4" tall. Metal, urn shaped Salt & Pepper. Federal buildings on the fronts and Hall of Science on the backs. Marked World's Fair underneath. Bottoms are marked N. Shure Co. Importers, Chicago, Made in Japan. Good condition overall. Small dent on the cap on one. Darkening to the finish overall. 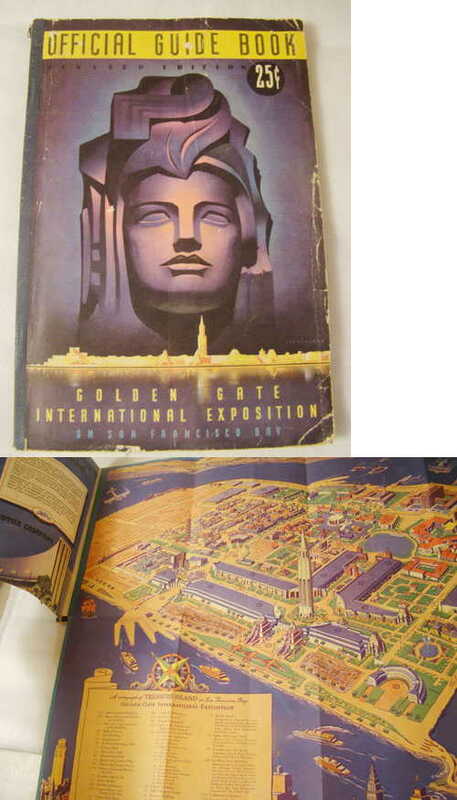 1933 CHICAGO WORLD'S FAIR HARDBOUND BOOK! 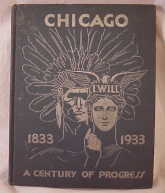 Scarce hardbound book, that covers some rarely found interests of the City of Chicago and the 1933 Chicago World's Fair . Facts and pictures are incorporated into the review that begins with President Roosevelt and proceeds into things that deal with the city of Chicago as it was begining in 1833, thru the 1893 Columbian Expo to the 33 fair. Very interesting pictures and reading on most of the buildings and businesses that were in Chicago in 1933 and before. 1964 NEW YORK WORLD'S FAIR SOUVENIR PLATE! Original souvenir from the NY World's Fair. 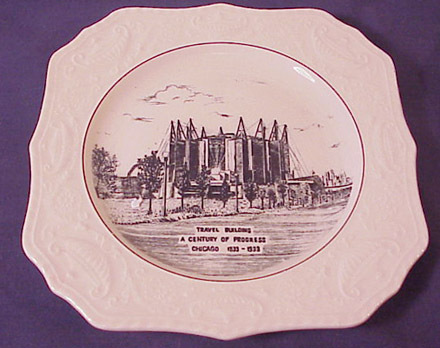 9-1/4" china plate with images for the fair. The Unisphere, Heliport, Monorail, Tower of light, Pool of Industry, Swiss Sky Ride. Green images, cream colored glaze. Excellent condition comes with its period wire plate hanger. Original large hardbound book titled: "World's Columbian Catholic Congresses and Educational Exhibit". Printed by J.S. Hyland & Co. of Chicago © 1893. Three volumes in one. Containing Official Proceedings of all the Chicago Catholic Congresses of 1893, giving in full addresses delivered, on the Catholic Education Day at the World's Fair, Columbian Exposition. Embellished with numerous engravings. 800+ pages. 10-1/4" x 7-1/2" x 2-1/2". Book is in very nice condition. Complete, all binding intact. Pages are clean, crisp and free of major damage. Gilt edges on the pages still has a nice sheen. Some wear to the cloth cover boards, corners bumped, rubs, darkened over time. A rare book for any collector. 1933-34 Chicago World's Fair Black Forest Inn Souvenir Menu! Chicago Beautiful Souvenir Views of World's Fair 1933! 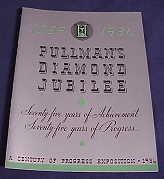 Rare 1933 Chicago World's Fair Garden & Flower Show Horticultural Building Guide Booklet! Silver metal tie clip, with front insert, blue and gold raised enameling. 1933 Chicago fair logo on the center medallion Good condition, with some finish wear. Lines. 12" x 4-5/8" when unfolded. Nice condition, no tears or major damage. 1933-34 CHICAGO WORLDS FAIR OWENS GLASS COMPANY BROCHURE! the full panorama view of the plant and the glass making process. Also show dozens of various bottle produced at that time. 22-1/2" x 6-1/8" when unfolded. Also lists Owens fair glass showings. 1933 PENNSYLVANIA RAILROAD WORLDS FAIR BROCHURE! Pennsylvania Railroad exhibit. 6-3/8" x 20-3/4" when unfolded.